With a rising number of young adults on the spectrum entering the workforce, it is becoming increasingly important to help build autism awareness among employers. 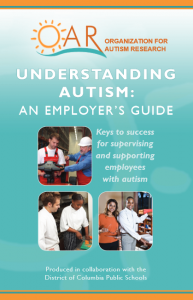 OAR collaborated with the District of Columbia Public Schools to produce a short resource entitled Understanding Autism: An Employer’s Guide to help front line supervisors support their employees with autism in the workplace. The guide will offer basic information about autism and the workplace, as well as keys to success that supervisors can use as they orient, train, and support the professional growth of their employees.